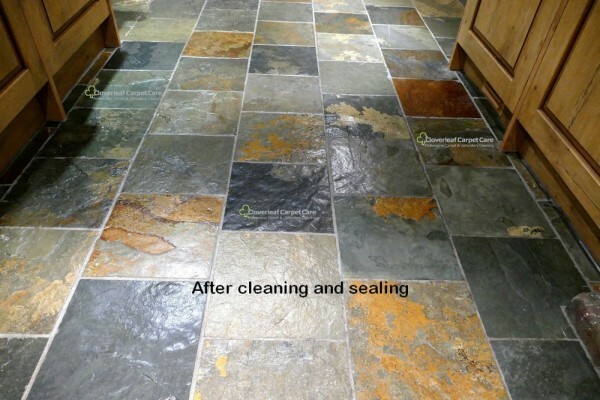 Slate Floor Cleaning and restoration Service in Cheshire. Slate floor tiles come in many designs and colours. Periodic maintenance and deep cleaning will prevent unsightly grime and dirt from building up. Cleaning and sealing will also enhance the beautiful colours and keep them looking as new. 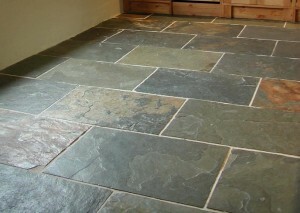 If your looking for slate floor cleaning in Cheshire, your in the right place. Areas covered for slate floor cleaning in Cheshire include: Alderley Edge, Altrincham, Congleton, Chester, Crewe, Nantwich, Frodsham, Hale, Holmes Chapel, Knutsford, Lymm, Middlewich, Northwich, Sandbach, Tarporley, Winsford, Warrington and Wilmslow. Slate flooring stone tiles are very popular due to the many different styles, colours and designs available. This type of stone flooring varies in composition and density. Most types of slate tiles are porous and it is beneficial to apply some sort of sealant or polish once the floor has been cleaned. Many types of sealant or polish are available which will help prevent staining or spillages being absorbed into the stone. Some types of polish and sealant will also prevent the floor from shedding loose dust and bits and create a permeable finish which is easy to clean and maintain. Our cleaning method can remove years of grime and dirt to reveal a fresh new surface to your slate or stone floor tiles. 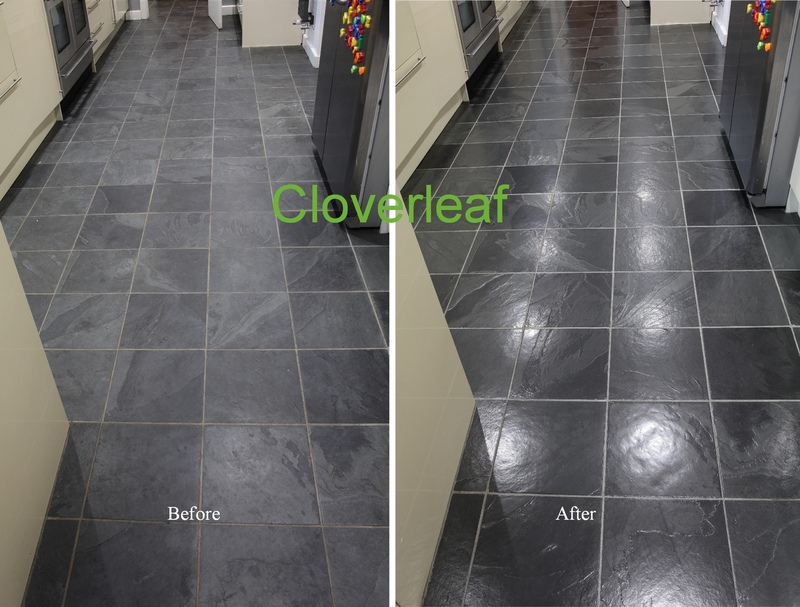 A typical example of how a slate floor can be stripped and cleaned followed with an application of polish. 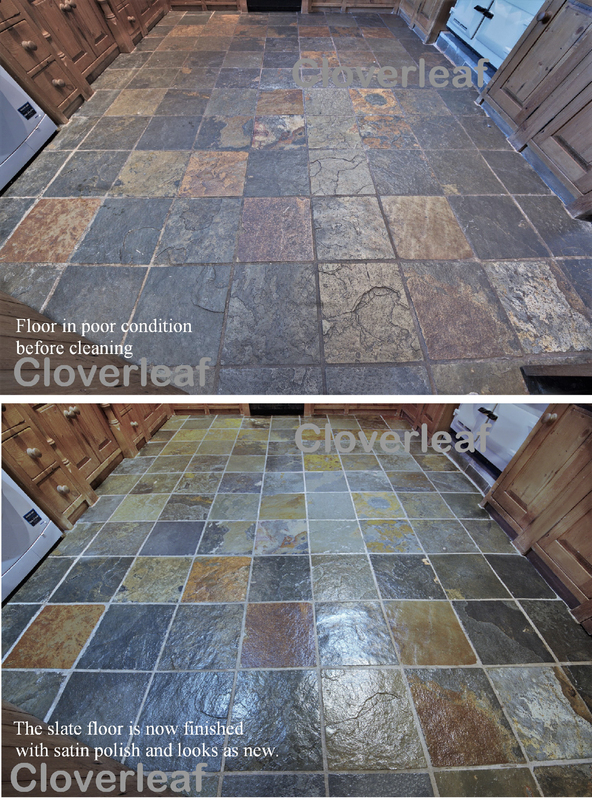 The images below are of a Cheshire slate floor cleaning and stripping job in a barn conversion. Nine years of use had worn and scratched the previously applied polished surface. The floor was stripped and cleaned, with a new application of several layers of solid polish. This has restored the rich colours with a non-slip anti-scuff finish. An application of solid floor polish on stone flooring can prevent grit and dust coming away from the stone and give an easy clean admirable finish. Slate floor renovation. Old slate floor cleaned in Cheshire and restored with a new coat of seal and polish. The images below are of a slate floor which was very dirty. The client had recently moved into the property and was not happy with the old floor which had been laid many years ago probably during the 1970’s. The floor was stripped clean and several applications of seal-polish were applied. This has produced a lovely satin sheen with the natural colours revealed. The slate floor is now easy to clean and maintain with no dust or bits coming away from the surface. The floor seal will maintain the looks of the floor and last for many years. Another example of a slate floor cleaned in Cheshire. 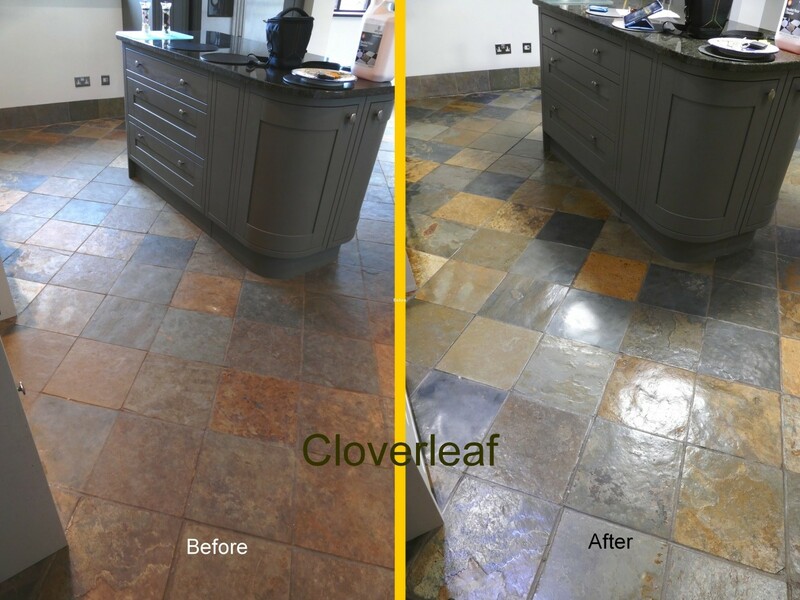 This slate floor was around 15 years old and was difficult to clean and maintain. The floor was stripped and cleaned and an application of satin polymer was applied. This has transformed the floor to reveal the outstanding colours and is now so much easier to keep clean, it looks better than new! This slate floor in Cheshire had many coats of old floor polish which was holding the dirt and grime. The old floor seal was removed with a floor cleaning machine, heavy duty stripper and an abrasive which has brought floor up like new. The floor will now be easy to mop and keep clean. Another very happy customer! 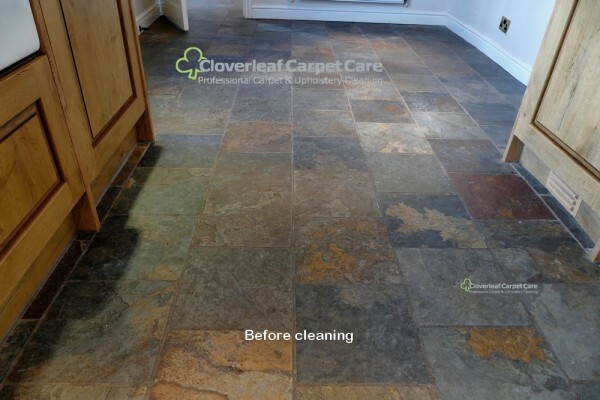 This slate floor in Altrincham Cheshire had never been sealed and therefore was difficult to mop clean and spillages were difficult to remove form the floor tiles. The floor was stripped and cleaned and finished with an application of satin seal. It will now make it easy to mop clean and spillages will stay on the surface which can easily be wiped up without penetrating into the stone. Another very happy customer! A slate floor cleaned in Knutsford Cheshire. A slate floor in a kitchen area which had become very grubby. The floor was stripped clean and an application of satin floor seal applied which will now enable easy cleaning and dirt and spillages will not ingress into the floor tiles. The floor looks as good as new.